Is research killing your best new product ideas without you even knowing it? 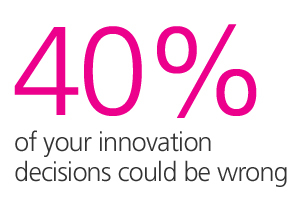 Unless you’re using Kantar TNS, 40% of your innovation decisions could be wrong. Shareholders give you no thanks for launching a product that attracts most of its volume by poaching customers from the existing franchise, particularly given new introductions typically deliver lower margins than existing products.